OUR LENT SERIES - “The Book of Exodus: Let My People Go!” Throughout the book of Exodus God reveals who he is through his absence and his presence, through his silence and his speech, through his wrath and his mercy, and through his judgment and his amazing grace. In doing so, the book paints a beautiful portrait of Jesus. Join us for worship every Wednesday evening in Lent, beginning Ash Wednesday, March 6th. EASTER BREAKFAST: If you can help with preparations on Saturday morning, April 20, or help serve on Easter morning, April 21, please contact Pam Williams or use the Sign Up Genius link here. EASTER LILLIES: If you wish to purchase an Easter lily in memory of or in honor of a loved one, please sign up in the communication center. The plants are $9.45 each. Please write your check to Beautiful Savior, and note in the memo area “Easter Lily.” You may place your check in the offering plate. 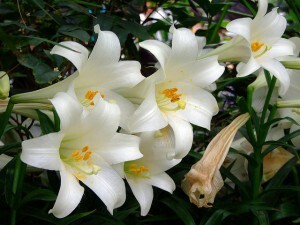 Lilies may be taken home any time after the 10:30 or 10:45 service on Easter.